As a book conservator in private practice, I’m sometimes a bit envious of my colleagues who work in libraries. They often deal with a wide variety of objects other than books. So I’m excited to start planning a housing for Kim Novak’s grey suit that she wore in Alfred Hitchcock’s 1958 classic Vertigo. This is for a private client who collects movie related items. As she pointed out to me, this suit is more than a costume, but an essential part of the storyline, much like Judy Garland’s ruby slippers from the Wizard of Oz. 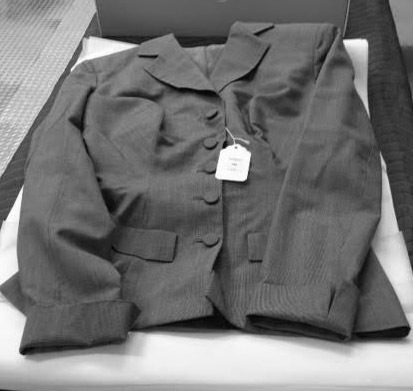 Kim Novak’s grey suit worn in Vertigo. Made by Edith Head. My Photo. Next PostNext Improved Corner Cutting Jig and Loaded Stick!